Hi everyone, just to say a big heart felt thank you from myself firstly and also Samantha’s family! I raised an amazing £140 in the office for epilepsy awareness day 2018 and I am so so grateful to you all! Thank you to everyone who also joined in with their purple wear on the day. I am very touched & glad to say I work for a company of such spirit & generosity. The Brands Hatch track day went well yesterday with the Streamline stickers on the rear wings. I had 4 people come up to me saying that they always use you when they need a cab and 3 others that said they live in Brighton and would use Streamline. Those people that I chatted to for a while said that whenever they need a taxi they would try to give Streamline a call and not another company. They also all put your 01273 202020 phone number into their phones. Just to say thank you so much for all the excellent service we had in the run up to the exams and prompt and efficient service delivery over the weekend. It made a stressful event so much easier and the people involved were delighted with their door to door transport without any fuss or confusion. I wish I could phone every company and be put through to a human being like you do with Streamline. Only good things to say. I never want to have to navigate through a series of automated commands or say "yes" or "no" to a robot and with your firm I never do. Please don't change that. Dear everyone connected with the only important firm of taxis in Sussex. Many, many thanks for all your help and assistance over the past year ~ very much appreciated. I just wanted to write to you on behalf of Fairlight Nursery and Primary School PTA to thank you for your recent support of our Winter Fair. Having your help really made a huge difference to our fair, it added that extra sparkle that made the event a happy one for all who attended and helped us to raise vital funds. The coconut shy and popcorn machine were both huge hits! Without your wine kettle and water boiler we could not have been able to offer mulled wine, cider and hot chocolates to warm up the parents and teachers - it was a very cold evening. Without your lighting systems the fair would have had little colour and our Christmas tree would have been invisible - instead it was a riot of disco colours and the best tree we have ever had. And most importantly of all, without your megaphone, Mr Jordan, our headmaster would have really struggled to make himself heard when calling the raffle winners out. This was the best raffle shout-out we have ever had too. Your continuing support in helping to provide resources we simply cannot afford in this current budget climate is really valued. You make such a difference to this local school, local kids and local families. We love Streamline! Just wanted to say a massive thank you for the loan of your popcorn machine, mulled cider kettle and radio mics. It was also really kind of you to donate taxi vouchers as prizes. Sunday’s Christmas film was Arthur Christmas with The Snowman and the Snowdog as a trailer. 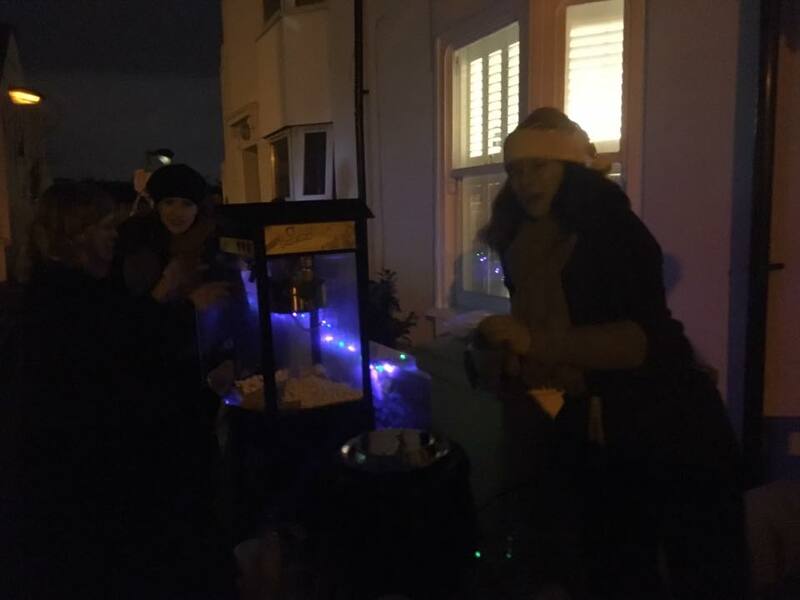 These events are valued as priceless by local residents and you just made them better – the kids were thrilled to get real popcorn made right there in front of them in their street. 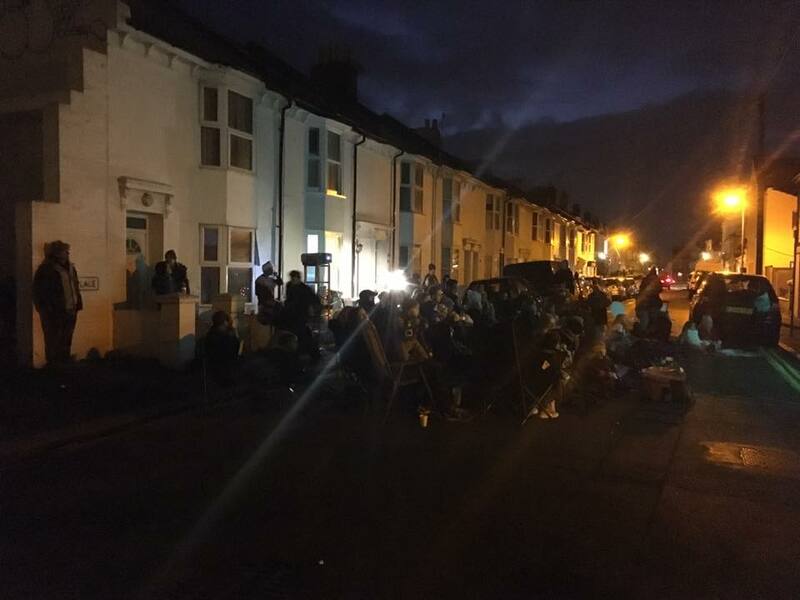 The adults were just as knocked out to have hot mulled cider while they sat in their deckchairs staring up at your logo splashed in lights right across the whole side of a terrace of houses. Thanks again and here’s some photos. I just wanted to say how amazing you all were, the operators who took my bookings and made me feel they really cared about my situation and the drivers who were so kind and helpful. I knew your company was one I could rely on to get me to my many appointments on time and with care. Please do pass my thanks on to everyone. Brilliant, reliable service from start to return journey. Care & attention of your drivers, including driver of training 401. Just superb. Praise be! Will use you again, super job. I am very flattered and humbled by the comments on the app feedback. I can honestly say that every member of staff I've met from Streamline, whether it's on the rank or in the offices have been brilliant and are a credit to the company. I wanted to let you know that one of your drivers helped me find my phone last night in a very professional manner when I lost it, which he didn't have to do. We wanted to take a few moments to write to you following the event we held in support of raising money for Owen Leggett. A massive success and as a family we raised £4830. This would not have been possible without your support and donation. The money raised will enable sharon to purchase not only the specialised trike but she has also been able to enquire about a comfy seat that can be specially adapted for owens needs giving him both the support he need physically but also allowing him to be more involved with the family life and allow him to be moved from room to room in a more relaxing way. His wheel chair which sharon feels will be a benefit. As we planned for this event we truly didn't realise how people would want to get involved and support us and it totally reinstates your faith in humanity. Sharon would like to say thank you to you and for giving her son a better quality of life. I want to thank the taxi driver who has just returned the glasses I left in his cab this morning. But I can honestly say in 45 years of using southern streamline I have never had cause to complain. This was an important civil partnership and at these times there tends to be happy confusion and complications amongst family members. My wife jo was the sole event photographer. Our car was parked in the local park and ride and on completion of the ceremony we hailed a taxi to take our party from the town hall back to the park and ride . On arrival at the park and ride we exited the taxi in a hurry and paid the bill in cash . In our hurry we left an extremely expensive cannon camera on the back seat. Not only was the camera a valued personal asset ( my wife had owned it for 10 years) but it also held all the photos from the civil partnership event and was the only record of the important family event . We didn’t realise the loss until later that day and then it dawned on us that we must have left it in the taxi and that we had no way in which we could identify the taxi or the driver. Be handed into the police . Simply find and steal the camera. Recovery unless the camera were handed in to the police . When I got the mail like most people today, I suspected a scam , but in due course both sides identified the camera which was then recovered by my brother in law . Michael refused to take a gift in return for recovery of the camera. In summary he went to enormous efforts to return the camera. Streamline taxis is very fortunate to have such an honest and customer dedicated driver in the team . we are next in Brighton . Taxi journey egremont place - brighton station (booked approx. 11.55 on 13 august 2015) and subsequent forgotten handbag. I caused an awful lot of bother yesterday when I left my handbag in the taxi that took me to the station, but your hq staff and the two taxi drivers who helped me were courtesy itself. The kind driver who lent me his mobile telephone to contact you was very gracious. I could not catch his name with my panic and the heavy rain falling, but his number was 163, and I think his name was Omar? The driver who brought back my bag for me was very gracious, although I had cost her some time. Unfortunately I could not get her number, but it will be in your records. You should know that the telephonist at 74 74 74 was extremely helpful. Knowing nothing about it, she went to the dispatchers office, found out, spoke to the driver on the phone with the correct info and came back to me saying on the way and won't be too long. Nice to find someone who cares. As I mentioned to you today the customer taken to london and back by our driverahmad – rang to particularly commend this driver, for his careful driving, patience, and general excellent service whilst conveying the passengers. Some wonderful feedback about one of streamline's call centre staff. Well done val, it is always a pleasure when somebody takes the time to write about great service. I just wanted to say that after never having a good experience with taxi services, it really has brought warmth to my heart that a complete stranger would take the trouble to ensure I was okay 20 minutes after I called. I hope you can share this with her and that she can be congratulated for her thoughtfulness, and in that moment as I was so upset it reall did help knowing that a stranger was looking out for me." You did a job 23/1/15 taking a lady from montpelier place to the station.The lady has taken the time and trouble to call operations to say that you were “the kindest and most helpful taxi driver that she had ever had.” thanks for representing streamline in such a good way. Friends of the elderly december 2014 I just wanted to say a huge great big thank you for the free taxis you put on for our ‘be a friend christmas lunch’ in brighton in december. Most of us are lucky to have regular contact with friends and family, so it is shocking to think that 5 million older people see their tv as their main form of company. Many of the 100 older people who came to the lunch have no family, friends or relatives to give them a call to say hello or help them get out of the house. A weekly call or an afternoon out having lunch with other older people may seem like a small gesture, but for the older people we support, it’s a lifeline. We believe that loneliness and isolation, which can have devastating effects on an older person’s health and quality of life, should not be a part of growing old. Our aging society is becoming increasingly isolated, and your kind offer of a free service helped us support the most isolated older people enjoy the festive season together, rather than staying at home alone. Apologies too for the mix up regarding the return journeys, and thanks to your driver for coming to collect the passengers so promptly! Thank you for helping us to give older people friendship, support and a reason to smile. Hello. I have just arrived home from a night out at the "Cow bar" at the seven dials. We had a driver collect us at approximately 11 pm to take us to 4 stops finishing at valley drive brighton. Our driver, middle aged (sorry!) glasses, fairish hair, large taxi was an absolute gentleman. He got out at each stop to open the door and most importantly waited for everyone to get through their front door. A few years ago, my son rory, who was about one at the time, became poorly in the night with laboured breathing. I called the out of hours medical number and after speaking to a doctor, was told to take him to the emergency gp based at the royal sussex l as soon as possible. It was about 10pm on a friday night. I called streamline to ask for a cab. They said they were very busy (which didn't surprise me) and that there was about a 45 minute wait. Then they asked where I was going. “I’m going to the emergency doctor at the hospital because my baby is ill.” “ok” they said. “we’ll see what we can do.” the cab was there about five minutes later. After we’d finished at the hospital, , I called again for a cab home. They recognised my name and again we only had to wait a few minutes for a taxi. The same driver turned up to take us home. I was incredibly grateful to streamline and have always remembered it. Hello all I just wanted to say a very big thank you to the driver and telephone operator who located my daughter after she was put off a brighton and hove bus - alone - in an unlit section of the a27 between falmer and lewes late on saturday night. She has told me about her ordeal, having to walk in complete darkness for 30 minutes or so along the dual carriageway until she reached a road sign where she was able to call for help. The bus driver left her in this dangerous location after she 'missed' her stop at coldean lane on her way to a friend's house and asked how she could get back. (rather than suggesting she stay on till the next stop and make a call from safety, he stopped the bus on the a27 and told her she should get off!) my daughter had no idea where she was and when she finally found a street sign in the darkness and rang streamline, the lady who took her call prioritised the pick-up and delayed finishing her shift until she had been collected. She also called my daughter back to make sure she was ok while she was waiting to be found. I didn't hear about my daughter's predicament until the following day (she didn't want to worry me on the night!) and I am so relieved to hear that you took the trouble to locate her as swiftly as you did. Things could have turned out differently for my daughter as a young girl travelling alone. I am extremely grateful to everyone who helped to bring her safely back on saturday. Another great job! Thank you for saving our evening! My mother is wheelchair bound, and we took her out for her first evening meal out for a long time, another local firm dropped us off and we booked a return trip, half an hour after they were due, we called to find out where they were, and they told us they didn't have a disabled access taxi available.